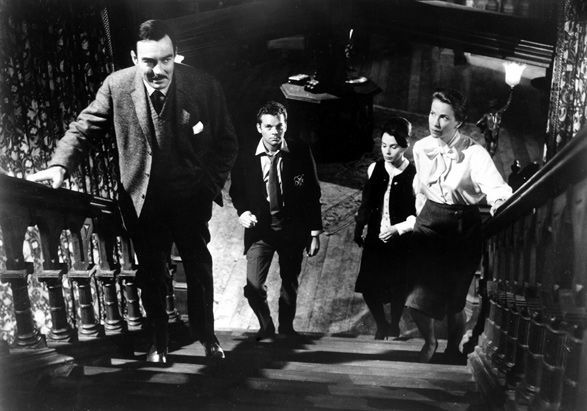 THE HAUNTING (1963), directed by Robert Wise and based on Shirley Jackson's novel "The Haunting of Hill House." A professor brings together a tiny handful of people with psychic experiences in their backgrounds to investigate an old New England mansion reputed to be haunted. 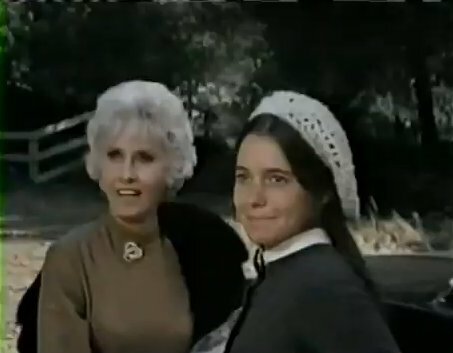 The house seems to develop an immediate connection with a repressed spinster, Eleanor (Julie Harris), or vice versa, with a poltergeist history. 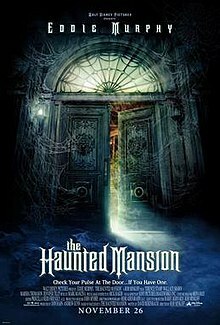 For me, this is the best haunted house movie ever produced. It's mostly faithful to Jackson's story, Wise plays all the moments for the greatest effect, the film is full of shadowed nuance and sadness, and the end-of-the-world/ColdWar/JFK/PSYCHO/TwilightZone era of the early-'60s ought to be the best period to do one of these pictures anyway... The music score, the performances (Russ Tamblyn as the "idiot boy" used to irritate me a little) are all just what they should be. And yet you never see a thing. For all we know, this could all be going on in Eleanor's mind. Even though the story the story takes place in America, you never forget for a second they filmed it all in England -- even though the movie takes place almost entirely inside. THE INNOCENTS (1961) From that same era, Jack Clayton directs Henry James' "The Turn of the Screw" scripted by Truman Capote. Another repressed spinster (Deborah Kerr) goes to serve as governess to two spooky children in a huge British mansion. The story seems to involve too doomed and unhealthy, departed lovers inhabiting the souls of the kids. There is a lot of contention out there as to which film is better, THE HAUNTING or THE INNOCENTS. For me, THE HAUNTING has the edge. 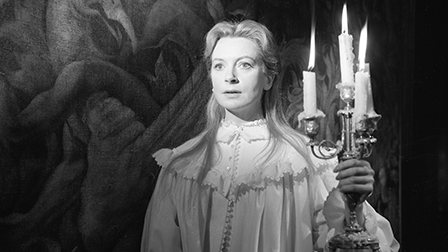 Because despite how many brilliantly-realized macabre vignettes and montages you'll find in THE INNOCENTS (and Freddie Francis' deep focus B&W photography is breathtaking, although the DVD is unforgivably washed out), the narrative in THE HAUNTING holds together better. I also have a complaint about the leading lady in THE INNOCENTS. Kerr considered this to be her favorite role, and I found her to be an intelligent person, but I also find her to be a bit too shrill and "actressy" in THE INNOCENTS and it distracts from the movie. (Yes, Harris is shrill, too, in THE HAUNTING, but that always strikes me as being more character-appropriate somehow; I suppose Kerr's character is supposed to be equally neurotic, too, but I always find myself blaming the performer in her case, not the role). THE OTHERS (2001). Almost unheard of in the modern era, a ghost movie which depends on mood and atmosphere, not gore and excessive special effects. The result was a summer sleeper which saw its box office actually rise during the first three months of release instead of drop off quickly (as usually happens, especially for horror films). It was written, directed, and scored by Alejandro Amenabar. A war wife (Nicole Kidman) waits and waits and waits for her husband to come home from the front, while her two children must be protected from the sunlight that burns their skin on contact. (Little danger, as the movie is as shrouded and overcast as anything shot in the early-'70s). And, along with the sense of cinematic restraint which makes THE OTHERS so good, the film also seems to understand that without the sadness you can't have the scary. Kidman, and the rest of the cast, are terrific. THE UNINVITED (1944). Directed by Lewis Allen, this was the first Hollywood film to take ghosts entirely seriously. A brother and sister (Ray Milland, Ruth Hussey) buy a cliff-hanging mansion on the coast of Cornwall, and ghostery ensues. The cast, locations, and lovely score by Victor Young, are all soothingly wonderful. Even Bosley Crowther almost liked it. The film has a lot in common with REBECCA, by the way, including the implied lesbian dynamic between the late mistress of the manor and her creepy caretaker/maid/doctor. Phew, I'm glad you didn't include The House That Would Not Die (a neverending disaster starring Barbara Stanwyck who performs her worst performance ever. Well let's hope that was her worst performance). Seriously now, you are such a connoisseur when it comes to classic movies, and reading about it always makes me want to watch them. Yesterday I was looking for the "Laura" movie but YouTube only has an edited version. I have no idea where to watch these movies. Of course that's a TV movie, "The House That Would Not Die," one of those early-70s things. Wasn't it a Spelling production?? Did you find Stanwyck more overwrought than usual? On the contrary, it looked as if she didn't know she was in the movie. The timing of the character's reactions is so bad - if there's any reaction at all. But it wasn't just her, the whole cast looks tormented. Now I'm a sucker for everything-seventies but this was just too awful. That other movie from the same era A Taste Of Evil is sort of bad but also very entertaining. Fabulous costumes by Nolan Miller, and the house looks like Carlo Agretti's mansion. Stanwyck's character goes ballistic in several scenes, I love it when she does that. You know there's something about this actress...I'm not sure how to describe it. Bette Davis was usually "what you see is what you get", she was a fantastic actress and interesting to look at, but never terribly surprising (imo). Watching Barbara Stanwyck gives me that "feeling in the underbelly" because she's such an unusual mix of classy and deliciously perverted. She makes me feel suspicious, if that makes any sense. Except in The Movie That Would Not Die. In fact, she was so absent that I'm going to ask IMDB to remove it from her filmography. I tried to watch the Stanwyck film a few months back and couldn't get into it. Very slow and dull. Oops it was Taste of Evil, with Barbara Parkins. I couldn't get into it. Yes, the first half really drags, but the second part is fabulous camp. Anybody remember that 90 minute TV movie with Hope Lange (from the early-'70s of course) where they keep squishing her with rocks for being a witch? A lot of demonic possession stuff in the '70s. But I don't think her house was haunted. Unless that's a sexual metaphor. If so, then it was haunted by Satan. How do you make those chess pieces change positions every time you post a message? It's not a GIF, so how do you do it? It's the ghosts of Jock & Ellie. They were really good at it. I have not seen most of the films listed. I loved "The Others" it was a good ghost story. I like the Changeling, Poltergeist, The Shining, The Amityville Horror , The Grudge, and Stir of Echoes. 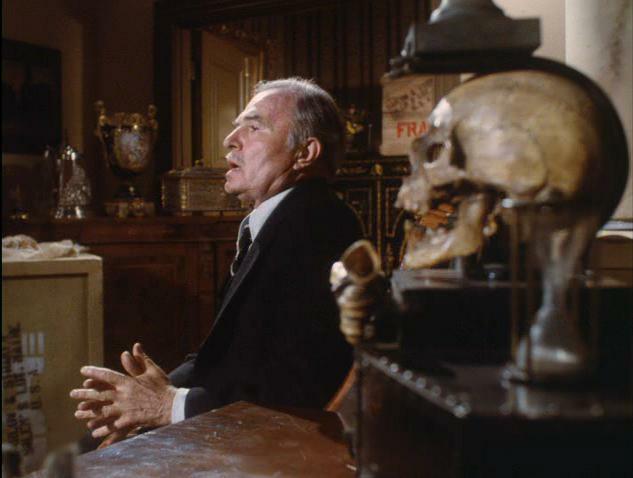 Does SALEM'S LOT qualify as a haunted house movie? Or a vampire movie? I think it's both -- there's a lot of focus on the house throughout the story. And there are lots of Undead folks there. I just got it on DVD a couple of months ago -- I first saw it on TV in 1979 and thought it looked and felt very cinematically creepy for a TV movie. It felt like a big screen film and, perhaps because it was a two part "miniseries," they take their time with it. In a good way. It builds slowly, the actors are good, Tobe Hooper's direction is understated and the score is really nice; you see a number of side characters who flesh out the character and the nature of this rural small town; there's a focus on atmosphere instead of shocks -- and, as a result, the shocks are much more effective when they occur. They steal so much from PSYCHO it's funny. It's more of an homage, I guess, from certain shots to the music. James Mason, David Soul, Lance Kerwin, Bonnie Bedelia, nearly everybody's good. And there are no blue lights. One of the endless contrivances in contemporary horror films, certainly over the last 35 years, is the use of blue lighting which is supposed to be "creepy" -- but nothing so cold and inorganic as blue lighting is ever scary. Since when do you use blue lights at Hallowe'en?? ... except for the glowing holy water at the start and finale of the picture. And that's the only thing that didn't work all that well in SALEM'S LOT: the coda scene when David Soul and CuteSadBoy are in the Guatemalan mission and their holy water starts to glow a blue hue. That's very, very TV... Oh, and finding Bedelia at the end -- you should never have found out what happened to her, but assume the worst. Those scenes were reportedly edited out of the theatrical version they later released, but that version is derided for being too truncated. At 180 minutes, three hours, they could have released it as-is to theatres, but they usually like movies to be only two-thirds that long. So they chopped it up. But the original television cut is one of the best filmings of a Steven King novel -- something that often doesn't always turn out very well. And I kept thinking: how did David Soul drop that taters-and-beer gut so fast from Season 4 of STARSKY & HUTCH, which had just completed filming a couple of months earlier...? Wasn't Salem's Lot originally a short story about a town and a cult, and I think there was a giant worm underneath the church, I think it represented the "evil"...it's been a long time since I've read that story. But I don't think it was about vampires. Or was that another story? 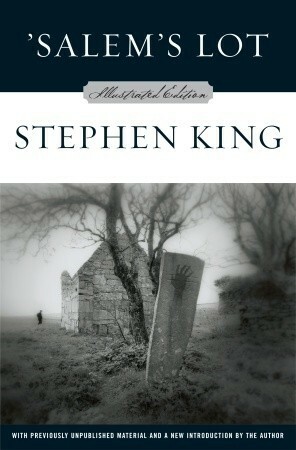 Stephen King himself has often remarked that "'Salem's Lot' was 'Peyton Place'' meets Dracula." ...then the town with the evil church and the giant worm must have been another story. Dune and the Damned? Dune and Doom? In the original 13 GHOSTS, a family is cheerfully evicted from their home as only a '50s family can, and over the cute little son's birthday cake (Charlie Herbert, whose character's 10th birthday party on the floorboards was reportedly filmed on his real life 11th birthday -- count the candles) a mysterious, creepy stranger materializes at the front door (played by an actor who'd be dead in six months) to deliver news that Dad is to appear at a lawyer's office the next day -- Pop is worried it might be a collection's attempt, but it turns out his rich uncle he hasn't seen in decades has recently died and left him his estate, which includes a big mansion, "one of those rambling old houses they built 50 years ago" (the house is actually 75 years old, and was razed in 1966) opines the lawyer, played by Martin Milner who was apparently a bit of a jerk during the early days of his career. 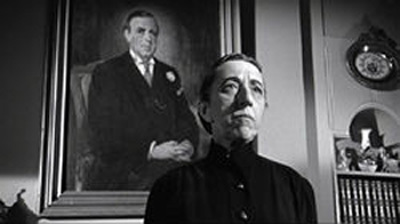 The family takes possession of the mansion, but the uncle's witchy housekeeper (Margaret Hamilton) assures them that the ghosts whom Uncle Zorba was nurturing are still present on the property. (And so, just possibly, is a major stash of cash). This is a William Castle production, so it's dumb. But when I first saw it (well after it was first released, I'd like to point out) I labeled 13 GHOSTS and HUSH... HUSH, SWEET CHARLOTTE as "the two scariest movies I've ever seen" -- and even at that age, I'd seen tons of spooky films on television... I'm not quite sure now why I granted them this stature (well, CHARLOTTE is indeed pretty grand) but in retrospect, it's interesting to realize that both pictures were photographed by Joseph Biroc, an excellent mood B&W cinematographer, even though 13 GHOSTS has very few of the bottomlessly shadowy shots of CHARLOTTE or even I SAW WHAT YOU (1965, which Biroc also photographed for William Castle). But there's just something Biroc did in the lab processing with the hues and values of his blacks and whites and greys that caused them to look as if they were looking back at you. So even in a silly, artless movie like 13 GHOSTS, there's still a creepy factor that's active. Also, I realized many years later that I'd confused scenes from the two pictures, the kitchen staff in a chef's toque and a meat cleaver (which can be seen in both) and the apparition which appears in 13 GHOSTS chopping off his wife's head I mixed up with the disembodied hand which is revealed by the opening french door in the music room in CHARLOTTE. And in a more innocent time, the high-pitched, squiggly voices of the ghosts (only seen with a special viewer the uncle had made) sounded absolutely terrifying. Today, of course, it's ridiculous. You also find out precious little about the ghosts' history or their ectoplasmic agenda. A kid-friendly little movie, the more cinematically jaded kids of today would probably find it infinitely too tame to be worth their time. But the casting, the tone and the era give it an appeal; it's kind of like a modest Hallowe'en party you attend where the pranks don't really come off all that well, but you're sort of glad you went. It actually does all feel quite haunted, even though it's stupid. But I would never let that nasty shyster anywhere near my little boy...!